I give full permission to The Great Pumpkin Farm to release any of the photos that I submitted for any and all advertising purposes. I also understand that all photos are kept by the Great Pumpkin Farm. 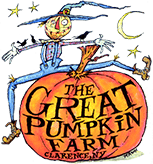 By submitting an entry you will be added to The Great Pumpkin Farm Email Club!